Twenty-five years of working with alpacas has culminated in the production of a robust, 120-page, A5, Glove Box Guide to Alpacas. The first half of the guide contains information on husbandry, cria care, nutrition, gastrointestinal parasites and reproduction. This section is targeted at farmers, veterinarians and students alike so that they can deliver best-practice husbandry to keep the alpacas in their care healthy. The back half contains information on the sick alpaca. It is a ready-reference for veterinarians on clinical examination, sample collection, restraint/sedation/anaesthesia, fluid therapy, and tables of dose rates for antimicrobials, pain relief and much more. There are tables to assist with interpretation of clinical pathology, and guides to euthanasia and post-mortems. There is a rough guide to alpaca husbandry on the inside back cover that all alpaca farmers should strive to undertake. The information has been gleaned from and written for alpacas living under Australian conditions. Much of the information can be extrapolated to llamas and camels. The guide is constructed with plastic pages and spiral binding so it can be thrown into the glove box/under the seat of the car/ATV without disintegrating! The front cover of the guide folds out to reveal the table of contents and list of abbreviations. Tabs on the margin of every odd page make finding a section easy too. There are record sheets in the guide for setting up on-farm biosecurity, infertility examinations of male and females, and post-mortems of adults and crias. All record sheets are available in higher resolution on this website to download, print on A3 then laminate, so they are always ready for use. Fill out the form during the procedure, take a photo for your records then clean off ready for next time. For those of you who have already purchased a copy, thank you, and expect to recieve a copy in the mail box in the coming days. 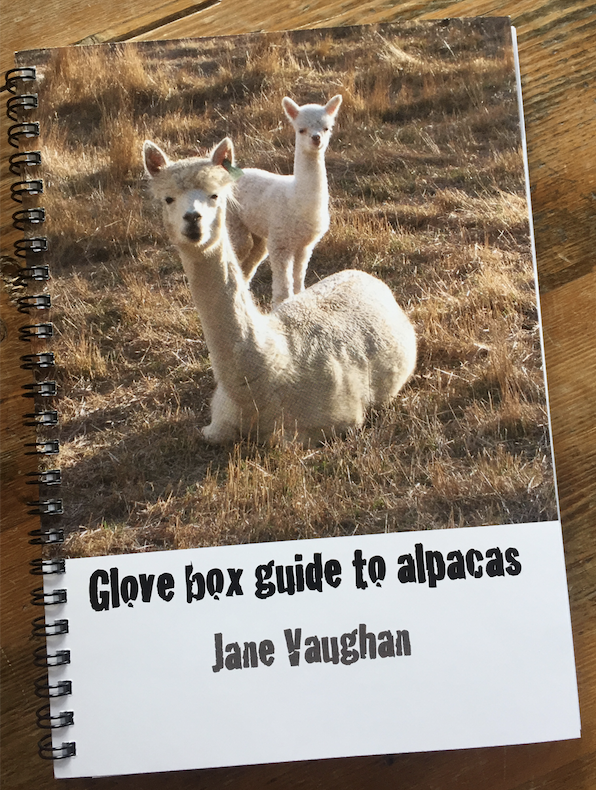 Those wishing to purchase a copy of the Glove Box Guide to Alpacas, please download and complete the book 2017 book order form.